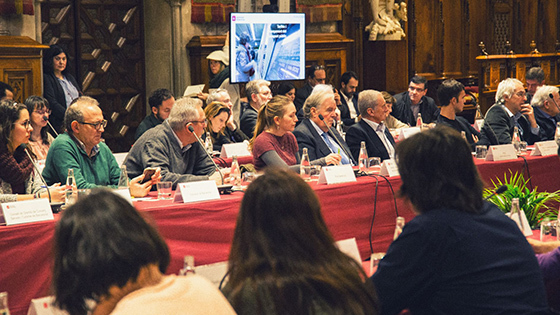 The Mobility Pact is a space of participation and dialogue made up of city associations and entities and local and supra-municipal administrations and institutions, which acts as a participatory forum and space for consensus around Barcelona’s mobility model and for good quality public space and a healthy city. The common aim that brings these organisations together is to progress towards sustainable and safe mobility, with the commitment and joint responsibility of everyone. In 1998 around thirty organisations, as well as Barcelona City Council itself, formalised and adopted the Mobility Pact to express their commitment to city mobility. Since then, the Pact has contributed to boosting initiatives and reaching consensus on actions to improve the mobility and safety of the city streets. Some hundred mobility-linked associations, companies, institutions and public bodies are part of the Mobility Pact. They have a permanent committee as the Pact’s managing body. The principle of sustainability. Now and in the future we need mobility that makes the environment and people less aggressive, and that increases planning, efficiency, saving resources and respect for the environment. Mechanisms need to be established to defend everyone's right to mobility. It is necessary to guarantee the quality of life of all citizens. It is necessary to encourage a change of attitude on the part of local authorities and citizens, through systems that guarantee road safety and discipline. It is necessary to design new urban development projects so they satisfy the mobility needs they generate. To reduce atmospheric and noise pollution, as well as the effects of mobility on the climate. To encourage a change to quieter, safer and more sustainable means of transport. To increase and regenerate public spaces intended for pedestrians, urban quality and accessibility. To integrate the use of bicycles into the city. To achieve an efficient, accessible, public transport system that is integrated on a metropolitan scale. To improve road safety and harmony between users of the various means of transport. To improve the efficiency of logistics and the urban distribution of goods. To promote the use of renewable energies and reduce vehicle energy consumption. To manage the provision of parking places for all means of transport on an integrated basis. To incorporate new technologies into mobility management: training, information and signage.